Engineered for the embroidery industry, the Peggy's Stitch Eraser features a specially designed cutting head and powerful motor which makes removing stitches faster and easier. Easily "erase" - remove machine embroidery stitches from most fabrics, even knits and satin jackets! Comes with protective oil, cleaning brushes and instructions. The latest incarnation of Peggy's famous Stitch Eraser® includes the Stitch Eraser® itself, the detachable power cable/charger, user manual, cleaning solution, and cleaning brush. Engineered for the embroidery industry, the Peffy's Stitch Eraser 8A features a specially designed cutting head and powerful motor which makes removing stitches faster and easier. The Stitch Eraser 8 (cordless model), can be used plugged in or unplugged. While plugged in, it is charging, even when running. The cord is 70 inches long, and the adapter that plugs into the wall is about a 2" cube. This adapter changes the 120 volt AC current to 3.6 volt DC current. The unit also comes with a cleaning brush and oil for the blades. Blade #3 is for Corded or #8 is for Cord/Cordless models. 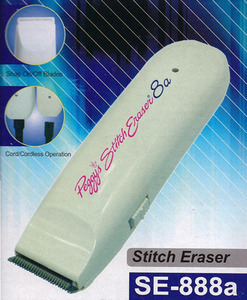 Peggy's Stitch Eraser removes stitches in fabric without damage to material! A must for anyone who sews! How to Use a Peggy Stitch Eraser Turn the garment inside out - Remember inside out/upside down. SATIN STITCH: Turn the PSE3 on and point the "tooth area" of the blades against the grain of the satin stitch for a second and then move along gradually in one direction or move it back and forth one or two times until the backing shows up. Continue sliding across the stitched area. After that, flip the hooped garment to the front and pick the stitches out by scratching it with your finger nail or use the PSE3. 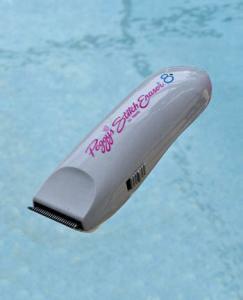 Peggy's Stitch Eraser removes stitches in fabric without damage to material! A must for anyone who sews! How to Use a Peggy Stitch Eraser Turn the garment inside out - Remember inside out/upside down. SATIN STITCH: Turn the cutter on and point the "tooth area" of the blades against the grain of the satin stitch for a second and then move along gradually in one direction or move it back and forth one or two times until the backing shows up. Continue sliding across the stitched area. After that, flip the hooped garment to the front and pick the stitches out by scratching it with your finger nail or use the Peggys Stitch Eraser on top. Lightweight and portable, weighs only a few ounces! Is Here to Help You! Peggy's Stitch Eraser® is the original Stitch Eraser® tool designed by an embroiderer for embroiderers. It is used to remove stitches from embroidery and all types of stitch patterns. * A must for anyone who sews! The latest incarnation of Peggy's famous Stitch Eraser® includes the Stitch Eraser® itself, the detachable power cable/charger, user manual, cleaning solution, and cleaning brush. The new model worked so much better than my old one. The old one said it was recargeable, but it never held a charge. This one does the trick. I've ordered from you before and I am very happy with your company. I wouldn't hesitate to order from you again. Did not use telephone customer service, but did use email and have expert service. This is one of the best companies that I have used and is very nice to have such good service and quality. Thanks so much. Speedy delivery to Australia - thanks!! Great company, I've purchased other products from your company and have yet to be disappointed in website, cost, and speed in which the product has arrived. I look forward to my next transaction knowing that your company goes above and beyond. Great company to deal with! I will do business with you again. I was very satisfied with my purchase and your customer service. It doesn't get any better than this, placed order and it was in my hands 2 days later. Thank you! Absolutely delighted with product and service! I certainly would order from this company again, and I will share my recommendation with friends. Fast service. Will let you know about quality after Christmas!!! The people I dealt with were very helpful. I'll be ordering again. The prices and products and selection are better than Nancy's Notions! I was amazed at how quickly I received my purchase! Thank you. I have always experienced the highest quality products and customer service with anything I have purchased. Thank you! I was very pleased with the price offered for the product I bought. Actually, it was the same price as other sites, but with free shipping, which made it less expensive in the long run. I was very impressed with how fast the order was processed and sent. I think I received it in about 3 days. I'll absolutely buy from you again in the future! Wahl W9962-717 Cordless Handheld Electric Quick Seam Ripper, Thread Eraser Shaver, 4x1.5"